Chip Kiefer (on ladder) and Nick Bankert of the Central Adirondack Association hang a banner to welcome visitors of next weekend’s Snodeo in Old Forge. Photo by Marianne Christy. With the colder temperatures and snowflakes in the air, one can only think that winter is right around the corner in Old Forge. And with winter comes winter sports, especially snowmobiling. 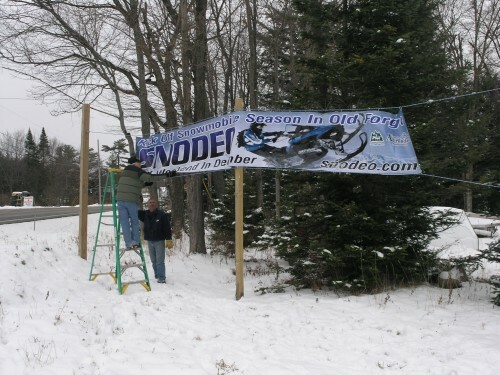 The 36th Annual Snodeo Weekend is the Central Adirondack Association’s kick off to the snowmobile season on December 7, 8 and 9 at the George T. Hiltebrant Recreation Center. All four major snowmobile manufacturers will be displaying their 2013 machines as well as offering a chance to win one in this year’s Snodeo raffle. For a $20 raffle ticket, the grand prize winner will get their choice of one of four sleds: a 2013 Arctic Cat F 1100 LXR from Big Moose Arctic Cat, a 2013 Polaris Rush Pro-R Retro from Don’s Polaris, a 2013 Ski Doo GSX LE 600 E-TEC from Smith Marine or a 2013 Yamaha FX Nytro from Big Moose Yamaha. In addition there are five cash prizes from $100 to $1,000. Tickets are on sale now at the Old Forge Visitor Information Center, at all of the snowmobile dealerships listed above or, new this year, online at www.snodeo.com. This entry was posted in admin and tagged Dana Armington on November 29, 2012 by Dana Armington. The George Taylor Memorial Shoot Out, the first major event during Snodeo weekend, is scheduled for Friday, December 7 at the White-Otter Fish and Game Club in Woodgate. Now in its 23rd year, the event is an opportunity for snowmobile enthusiasts to come together and watch “out of the box” snowmobile testing and races of this year’s hottest sleds. 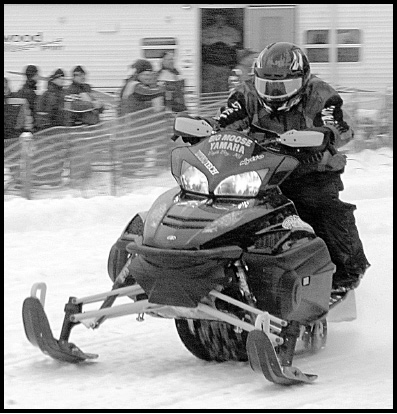 This year’s event, sponsored by American Snowmobiler Magazine, will feature sleds from Smith Marine in Old Forge, Fun Unlimited of Watertown, and D.D. Water Sports of Lowville. Action begins at 9 a.m. Throughout the event, all of the new 120 and 150 horsepower class stock snowmobiles will be tested, as will the unlimited and ultra performer stock snowmobiles, which include the Arctic Cat Turbo and the Supercharged Yamaha Nytro. Additionally, there will be a “Turbo Time” category to test the Arctic Cat Turbo sleds as well as a recently announced “King of the Hill” Shoot Out for 400 to 500 horsepower aftermarket sleds beginning at 9:30 a.m.
“There is a lot of excitement this year,” said Jim Czekal, co-organizer of the event, “and hopefully all the people who come to the Shoot Out will keep heading north to Old Forge for Snodeo. The White Otter grounds will be opened to spectators at 8 a.m. Food will be available for purchase on-site throughout the event. Among the many activities planned for the second weekend of An Adirondack Christmas on Main Street in Old Forge will be the “Let it Snow” 5K Run/Walk on Sunday, December 2. The run/walk will begin at 9 a.m. at Point Park in the center of town and will take participants down the decorated Main Street, through the back roads of Thendara and back. There are already over 150 registered participants with many more expected, according to event co-organizer Beth Tickner. Currently there are runners registered from across New York, as well as from Michigan, Pennsylvania, and Vermont. All participants are encouraged to come dressed in holiday attire for a chance at winning an award for best costume. Additionally, there will be prizes awarded to the top three male and female winners in each age category. The categories are ages 19 and under, 20 to 39, 40 to 59, and 60-plus. This entry was posted in admin on November 29, 2012 by admin. 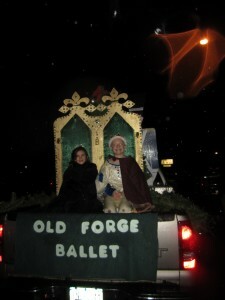 Old Forge Ballet offered a Nutcracker preview in last Friday’s Christmas on Main Street Parade. Photo by Wende Carr. The Beck siblings, David, Bella, and Sarah, will be performing multiple roles in the Old Forge Ballet Company’s December 1 presentations of The Nutcracker. David will play Christopher Drosselmeyer in Act 1 and the “Nutcracker” in the battle with the Giant Mouse. He will magically change to the Cavalier for Act 2 and will also be seen in Russians, Waltz of the Flowers and the Cavalier’s Variation at the conclusion of the ballet. David, 16, has previously performed the roles of Drosselmeyer, Fritz and Harlequine, Mouse King, Soldier and Nutcracker in the Battle in Act 1 and Russians in Act 2. Sarah Beck has been cast as the Sugar Plum Fairy. Last year she achieved her goal of dancing the part of Clara in the local performance, after playing most of the available roles since starting with the company as a young child. Herkimer County Public Health Office would like to remind the public that it offers the Shingles vaccine as well as other vaccines such as flu or pneumonia. There is a cost associated with the Shingles vaccine that can be covered under Medicare Part D plans, but the office recommends contacting your insurance provider before you get the vaccine to see if it’s covered. Doctor’s offices also administer the vaccine. In some cases the shingles vaccine is not recommended and as always your physician should be consulted if you’re considering the vaccine. Shingles is a painful skin rash that may appear on one side of the body or face and lasts from 2 to 4 weeks. Shingles is also called Herpes Zoster, and it is caused by the Varicella Zoster virus. The main symptom is pain and it can be severe. Other symptoms can include fever, headache, chills and upset stomach. Shingles can be more common in seniors or those with weak immune systems. In clinical trials, the vaccine (Zostavax) reduced the risk of Shingles by 50 percent. It can also reduce pain in those who still get shingles after being vaccinated. This information was provided by the U.S. Department of Health and Human Services. For more information on the Shingles Vaccine and other immunizations go to www.cdc.gov/vaccines, or contact Herkimer Public Health at (315) 867-1176 or the Office For the Aging/NY Connects at 867-1415. The Kiwanis Club’s Bob Thayer Memorial Free Holiday Movie for Kids is set for Saturday, December 15 at the Strand Theatre in Old Forge. Children ages 12 and under are admitted to the movie free of charge when accompanied by an adult who will also be admitted free. This year’s featured film will be will be “Rise of the Guardians” which tells a story of how Santa Claus, the Tooth Fairy, the Easter Bunny enlist the help of Jack Frost to stop the Bogeyman from engulfing the world in darkness. The annual event is being made possible by funding and support of the Kiwanis Club of the Central Adirondacks in cooperation with Bob Card and Helen Zyma, co-owners of the Strand, who donate the theater for the yearly event. Aside from free admission to the movie, children will receive popcorn and a drink at no charge. The theatre doors will open at 10:30 a.m. with a visit from Santa and Mrs. Claus. The movie will begin at 11 a.m. The Kiwanis Club would like to thank the Thayer Family and all those in the community who have so generously contributed to the various fund raising events that make programs like this possible. Town of Webb Police Chief John Russell would like to remind residents and visitors that all night parking restrictions will be in effect from December 1 through May 1, 2013. Parking is restricted on town, county and state roadways from 2 to 6 a.m. to allow for snow plowing and removal. Parking is also restricted in front of the Town of Webb School and on the south side of Park Ave., adjacent to the former Maple Ridge Ski Area.